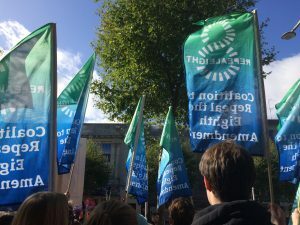 As the Joint Oireachtas Committee discusses the proposed three day waiting period for abortion care, the Irish Council for Civil Liberties (ICCL) has said that the waiting period contained in the proposed legislation does not comply with international human rights standards and that it should be removed. We are also calling for decriminalisation of abortion and for legislation for abortion after twelve weeks in cases where the life or health of the pregnant person is at risk. There should be no qualifications such as “serious” on the risk to health. A mandatory waiting period imposes an unnecessary restriction on safe access to abortion and also reinforces patriarchal notions of women as incapable of making decisions regarding their own health. It will particularly impact on pregnant people who are in abusive relationships, who live in remote areas, who live in direct provision or who struggle to find the resources to attend two doctors’ appointments. It will reinforce the current situation of inequality which has persisted even since the repeal of the 8th amendment and is thus incompatible with internationally recognised human rights standards. We call for its removal from the proposed legislation. We further call for the decriminalisation of abortion, particularly given that there is no longer a constitutional impetus for this after the 25 May vote. The Joint Oireachtas Committee on the Eighth Amendment recommended that all criminal sanctions applying to those who access abortion services be lifted and we would concur with this recommendation. One of the most serious issues with the 8th amendment was that it put doctors in the invidious position of deciding when the risk to the life of the mother became great enough that doctors could intervene to save her. The wording of the General Scheme risks falling foul of the same problem by stating that the risk to the health of the pregnant person must be “serious” before an abortion can be provided. The risk to health must never be qualified. We instead recommend that the wording suggested by the Joint Oireachtas Committee on the 8th amendment, “where the life or health of the woman is at risk”, be adopted. The Irish Council for Civil Liberties (ICCL) formed part of Together for Yes, and before that the Coalition to Repeal the Eighth Amendment. We signed on to the Coalition’s policy statement on the proposed legislation in March 2018 and we reiterate that commitment now. Further, we restate our support of Lawyers for Choice’s considered statement containing recommendations for amendments to the Bill. 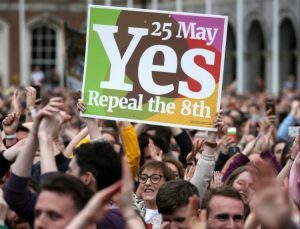 The overwhelming vote of the Irish people on 25 May to repeal the 8th Amendment was a watershed moment for human rights and equality in Ireland. Many of the ICCL membership have played key roles in the long battle against the 8th over the past 35 years. The members and supporters of ICCL also played an important part in ICCL’s work on this issue. ICCL membership fees support our political work, including when we take a position on a referendum question. Below we set out the specific activities which we have undertaken to contribute to this historic moment. The ICCL opposed the 8th Amendment to the Constitution in 1983 on the grounds that it would cause confusion and be unworkable in practice, and that it would not prevent women living in Ireland from needing and seeking abortions. In 1992 the ICCL opposed the referendum proposal to prohibit abortion where a woman’s life was at risk by suicide, and supported the constitutional amendments that guaranteed the freedom to travel and the freedom to impart and obtain information about abortion services abroad. The ICCL published a detailed policy paper in 2001 arguing against a further proposed constitutional amendment to prohibit abortion in cases of suicide risk. 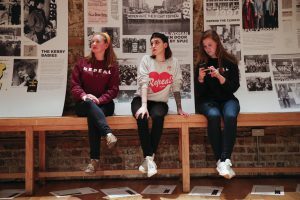 The paper criticised the government’s failure to address honestly the needs of the thousands of women who travelled abroad each year for abortion and the discrimination suffered by women and girls who were unable to travel. In recent years the ICCL has made submissions to the UN Human Rights Council, the UN Human Rights Committee, the UN Committee on the Elimination of Discrimination Against Women and the UN Committee Against Torture calling for the repeal of Article 40.3.3 of the Constitution, the decriminalisation of abortion, and the introduction of legislation providing for access to abortion in Ireland. The ICCL’s submission to the Citizens’ Assembly in 2016 is available here. We published a position paper on the 8th Amendment in 2017. ICCL was a founder member of INCLO in 2013 and one of the pillar areas of work of the Network is Religious Freedom and Equal Treatment. 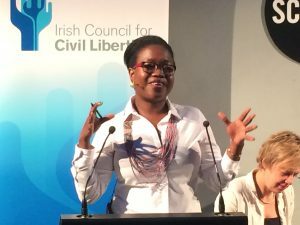 Under that pillar, INCLO has taken a particular interest in the issue of abortion rights and ICCL hosted and international convening on abortion rights in Dublin in November 2017. The timing of the event allowed a platform for international activists and experts to share their experiences and perspectives in advance of the final report of the Joint Oireachtas Committee on the 8th Amendment. Our international colleagues also had the opportunity to meet with leading Irish activists and members of the Oireachtas during the event. For details of the event see here. ICCL was a founder member of the Coalition to Repeal the Eighth in 2015 and provided logistical support to the Coalition in its early phases. We have played an active part in the Coalition’s work at all stages. In February 2018, as the Government committed to holding a referendum for repeal the Coalition to Repeal the Eighth joined with the National Women’s Council of Ireland and the Abortion Rights Campaign to form Together For Yes as the campaigning body for the referendum. Together for Yes was launched in March with ICCL as a member of its platform of civil society organisations. ICCL actively participated in the campaign platform and director Liam Herrick spoke at the Cork launch of Together for Yes. Once the proposition for the Referendum was published, the Executive of the ICCL Members Association registered as a Third Party for the period of the Referendum. In line with the requirements of the Electoral Acts, by registering as a Third Party which would campaign in the referendum, the ICCL Members Association was committing that only authorised donations could be used to fund any activities which were aimed at supporting a particular outcome in the referendum. Only ICCL members’ fees were used to fund our campaign activities – these being of an order of €40 per person and all from Irish citizens. By registering the ICCL Members Association as a Third Party (as ICCL has done in previous referendums), we separated our campaign activities from the other non-political work of ICCL, including our charitable work and our work which is funded by trusts and foundations. ICCL launched our own campaign Her Rights, which focused on the human rights impact of the referendum over the past 35 years. You can find details of the campaign here. 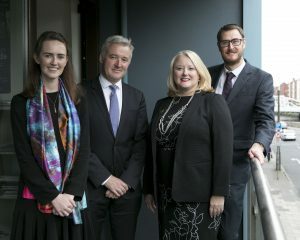 ICCL also joined with members of the legal professions and Lawyers for Choice to work with the sub-group Lawyers for Yes, which acted as the legal arm of the overall Together for Yes Campaign. Together with these groups, ICCL provided legal comment and analysis through the campaign. 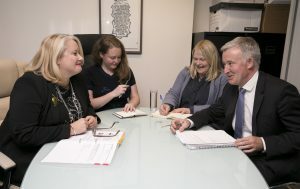 Liam Herrick provided comment at a press conference on 30 April and spoke at a briefing for members of the Oireachtas on 2 May. In the final week of the campaign, ICCL hosted a multi-media public event at Smock Alley theatre, entitled Under the 8th, which recalled the history of the 8th from 1983 and celebrated the role of the key leading activists who have led the fight against the amendment – including Pauline Conroy, Justice Catherine McGuinness, Ivana Bacik, Catherine Forde and Máiréad Enright. Read more here. During the course of the referendum, a number of issues emerged about restrictions on artistic freedom of expression, whereby visual artists and writers had events or works censored, restricted or cancelled due to their political content. ICCL led the resistance to these developments. We issued a policy paper on freedom of artistic and political expression and we publicly launched this paper by commissioning our own mural. 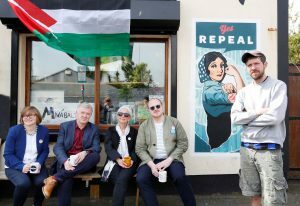 We unveiled this mural a week before the Referendum, and leading members of the arts community, including poet Paula Meehan and Project Arts Centre’s Cian O’Brien, spoke at the invigorating event in Phibsboro. Read more here. 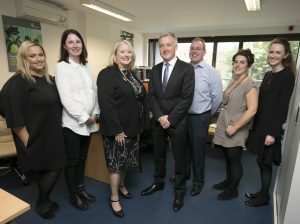 In the aftermath of the result, ICCL is continuing to work with partner organisations, including the Irish Family Planning Association and the National Women’s Council, to ensure that the legislation is compliant with human rights standards. As we have done since our foundation, ICCL will continue to work for women’s rights including reproductive rights. We will also shortly launch a project aimed at protecting and widening the space within which civil society can operate. This will aim, amongst other issues, at reform of the Electoral Acts of 2001, at protecting artistic and political freedom of expression during referendum periods, and at reform of the Charities Act so that it includes human rights work as a charitable purpose. The International Network of Civil Liberties Organizations (INCLO) firmly believes that women and girls have the right to be informed of and to have access to safe, effective, affordable and acceptable methods of fertility regulation of their choice. INCLO further believes that women and girls have the right of access to appropriate health care services to ensure safe pregnancy and childbirth. The ability of women and girls to decide whether and when to become a parent is a necessary precondition for the achievement of gender equality in all aspects of cultural, economic and political life. As such, the INCLO network supports the work of our members to make abortion services accessible to all women and girls worldwide. In Argentina another INCLO member, the Centro de Estudios Legales y Sociales (CELS), is highlighting human rights issues in the abortion debate ahead of a congressional vote on the issue later this month. CELS has been firmly advocating for the reform of unjust legislation which has caused the suffering – and sometimes the death – of thousands of women since its introduction in 1921.
said CELS’ Executive Director and INCLO Co-Chair Gastón Chillier, in his address to Congress ahead of the vote on 13 June. CELS also referred to international human rights jurisprudence and treaties regarding the abortion debate, emphasizing that Argentina is legally obliged to incorporate international standards and instruments already ratified into its legislation. Argentinians take to the streets in favour of legalising abortion. 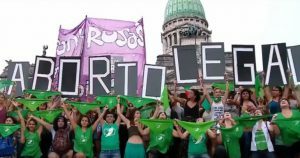 The feminist movement in Argentina is symbolised by a green bandana. The Irish government is currently fast-tracking legislation to be introduced in January 2019, which will allow for abortion up to twelve weeks without restriction. In the meantime, the government is investigating ways to facilitate access to abortion for as many as eleven women per day from Ireland still needing to travel abroad for care. For example, doctors may be allowed to refer patients to doctors in the United Kingdom, something which was illegal before. INCLO believes that women have the right to autonomy over their own bodies, and the State must ensure that this right is respected. Further, it must safeguard against women resorting to clandestine and often unsafe methods to end undesired pregnancies.